The PCA ensures that the highest levels of professionalism operate among its members. Companies and surveyors applying for membership must meet a number of strict criteria to ensure they meet the required standards (including qualified surveyors, approved financial status, minimum length of trading). All companies are audited on a regular basis to assure their standards of workmanship. Furthermore, if you have a dispute with a PCA member about their standard of work, the Association may be able to get involved to help resolve any issues. Swiftcure Limited have achieved Constructionline’s newly introduced Gold (Level 3) membership, an accreditation developed to accommodate the differing needs of suppliers and buyers. Swiftcure have constantly met the standard membership requirements of Constructionline for many years, which has now been renamed Silver (Level 2) membership. However, due to customer demand we have achieved the higher Gold standard which offers all the benefits of Silver membership, but with an extended Verified Pre-Qualification Questionnaire (covering Environmental Management, Equality and Diversity, Quality Management systems, and ensuring legislative compliance). The extended Verified PQQ goes beyond the data collected by PAS91 to ensure, companies like ourselves, have systems and policies in place to abide by legislation in areas such as Modern Slavery, Anti-Bribery and Corruption, and Equal Opportunities. In addition, we must support our membership with a Health and Safety SSIP certificate to meet the requirements of Constructionline’s Acclaim or “Deemed to Satisfy” SSIP certificate, demonstrating to Buyers that we also comply with Health & Safety legislation. Our customers can therefore feel assured that Swiftcure is continuing to raise its professional standards and be able to demonstrate clear systems, policies and procedures to increased scrutiny around governance and risk management. 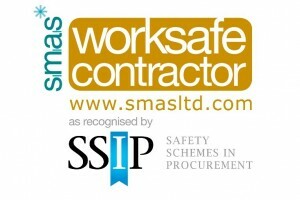 SAFEcontractor is a health & safety accreditation scheme for contractors. It simplifies the process of demonstrating to clients that we have health & safety policies and procedures in place. (Call Tel: 02920 266 242 to check our SAFEcontractor status). Successful assessment by SMAS Worksafe means that an organisation meets the recognised Stage 1 standard for H&S. This standard is recognised by the HSE and accreditation schemes that have quality assurance processes. SSIP assessments are all judged on core criteria approved by HSE. These core criteria describe what it means for a construction business to comply with basic health and safety law. The SMAS Worksafe assessment itself looks to ensure that contractors have (and use) an effective H&S Management System to ensure that any work they are engaged in is, so far as reasonably practical, carried out without risk to health and safety. TrustMark is a new initiative between Government, consumer groups and industry designed to help you find reputable firms to carry out repairs, maintenance and improvements in your home or garden. TrustMark is based around a set of Government-endorsed standards for trade associations, certification bodies and other organisations that wish to become approved scheme operators. As a Which? Trusted Traders our Company has been through a rigorous application process so you can be confident you are hiring a reputable Damp Proofing & Timber Preservation Company.